A camera crew from Flooded Cellar are currently in Lebanon making a video for Codex that looks at the relevance and importance of Codex standards, guidelines and codes of practices to the Near East region. The video will include interviews with government representatives, technicians from the national food safety committee, representatives from research and the Ministry of Agriculture, as well as those involved in food production, right along the food chain to restaurants and consumers. The video will examine Good Hygienic Practice (GHP), from "field to fork". This week the team have been out shooting the olive harvest and olive processing. Good pest management is vital. Olives are collected on clean nets and cloths (avoiding picking up olives from the ground). Workers use gloves and sort olives at the point of harvest to remove leaves and bad olives. The environment needs to be extremely clean and hygienic. The press visited has been fully modernised with tiled walls and double doors to keep dust and flies out. 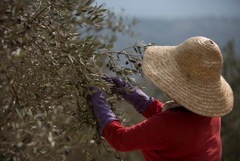 Workers wear hair coverings and overalls as they sort and clean the olives. A high proportion of producers and processors have not traditionally applied international safety standards as as they've always worked purely for local consumption. For export, obviously, they need to consider a whole different level of standards. The government is encouraging best practice and working to improve implementation. The processing plant also recyles the waste from the olive pressing into fuel logs, so that no waste is left lying around attracting rats.